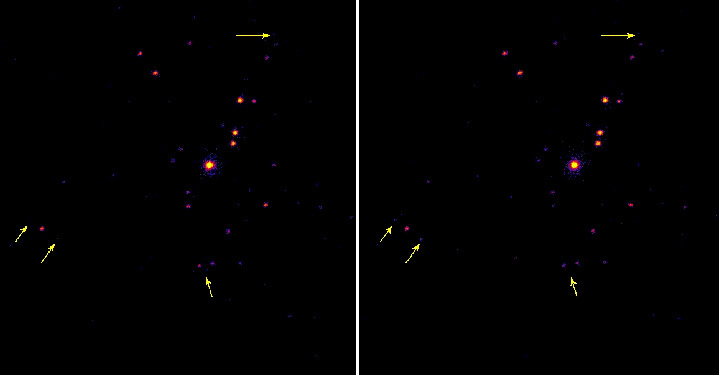 A new time-lapse movie, made from hours of Chandra observations, provides a remarkable X-ray view of the Orion Nebula, one of the closest star-forming regions to Earth. This long-duration exposure shows that, over the course of mere hours, many of the 700 objects in this field appear to "shimmer," or vary, in X-ray intensity. In addition to the known stars in the Orion Nebula, several systems containing stars about to ignite their nuclear engines also show X-ray emission. The tremendous amount of X-ray energy emitted within these objects could affect any developing planetary systems in the dusty disks around these infant stars. These observations are extremely important to understand since there is evidence that our Sun and Solar System may have formed in a similar region to the Orion Nebula. Using the High Resolution Camera (HRC) aboard Chandra, a joint team of researchers, including E. Flaccomio, S. Sciortino, G. Micela and F. Damiani of the Osservatorio di Astronomico di Palermo and Stephen S. Murray, F. R. Harnden, Jr., and Scott J. Wolk of the Harvard-Smithsonian Center for Astrophysics, observed the Orion Nebula region continuously for over 17.5 hours, far surpassing X-ray studies with previous satellites that lasted for only about 45 minutes at a time. This lengthy exposure may lead scientists to re-examine the very way they classify X-ray emitting stars. Due to the information from previous studies, some stars were dubbed "bright," "faint," "variable," or "flare" stars, depending on how they appeared at the time they were observed. However, the new Chandra data indicate these differently categorized stars may not belong to separate classes, but rather are stars observed in different stages of their activity. In addition to the X-ray variability, the team also detected X-rays from proplyds. Proplyds, young stars around which a disk can be seen, are believed to be embryonic solar systems that will eventually form planets. Our solar system has long been considered the relic of just such a disk that formed around the newborn Sun. X-rays may be a significant source of heating in the young disks and may hasten their evaporation. 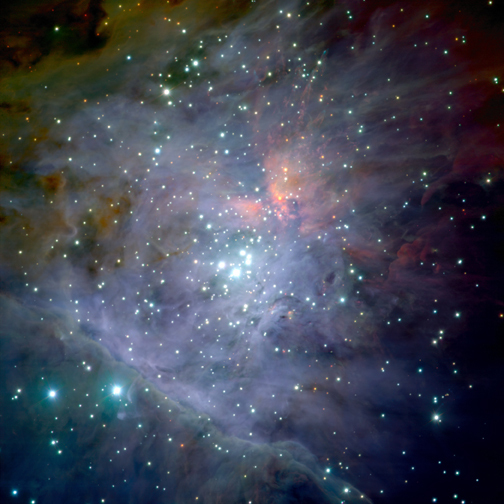 The Orion Nebula is a very dense concentration of about 2,000 very young stars formed during the past few million years. Scientists use the relatively nearby (1500 light years) nebula as a vast laboratory for studying the processes which gave birth to our own Sun and solar system 4.5 billion years ago. The discovery of such a wealth and variety of X-ray stars in this star-forming region may have a profound impact on our understanding of stellar formation and evolution. The Chandra HRC used to record these X-ray data was built by Stephen Murray and colleagues at Harvard-Smithsonian Center for Astrophysics. Coordinates (J2000) RA 05h 35m 15.00s | Dec -05° 23' 29.50"